The ubiquitous human herpesvirus 6 (HHV-6) may play a critical role in impeding the brain's ability to repair itself in diseases like MS. The findings, which appear in the journal Scientific Reports, may help explain the differences in severity in symptoms that many people with the disease experience. "While latent HHV-6—which can be found in cells throughout the brain—has been associated with demyelinating disorders like MS it has not been clear what role, if any, it plays in these diseases," said Margot Mayer-Proschel, Ph.D., an associate professor at the University of Rochester Medical Center Department of Biomedical Genetics and co-author of the study. "These findings show that, while in the process of hiding from the immune system, the virus produces a protein that has the potential to impair the normal ability of cells in the brain to repair damaged myelin." It is estimated that more than 80 percent of people have been exposed to HHV6 at some point during their early childhood. HHV-6 is the most common human herpesvirus and infections that occur during childhood often go unnoticed but the virus can cause roseola, which is characterized by a fever and rash in infants. A much smaller number—one percent of people -have congenital HHV6 where a single copy of the virus is acquired through either the father's sperm or mother's egg and is passed on to the developing child. While the immune system fights off the most active forms of the infection, the virus never truly leaves our bodies and can reactivate later in life. The herpesvirus 6 accomplishes this form of latency by integrating itself into our genetic code and thus hiding in cells and evading the immune system. One of the first studies to show an association between latent HHV-6 infection and demyelinating disorders was conducted in 2003 by URMC researchers David Mock, M.D., who is a co-author of the current study, Andrew Goodman, M.D. and others. They noted that HHV6 genetic code could be found in the brain cells of individuals with severe forms of MS. Viruses have long been suspected to contribute to MS, a disorder in which the body's own immune system attacks and destroys myelin—the fatty tissue that insulates the connections between nerve cells. However, while the 2003 study indicated that the herpes virus played some role in MS, it has subsequently become clear that the virus is unlikely to trigger the disease. The Rochester researchers in the current paper took a new approach and asked instead whether the virus could have an impact on a critical support cell found in the brain called oligodendrocyte progenitor cells (OPCs). These cells play an important role in maintaining the brain's supply of myelin. When myelin is lost to disease, age, or injury, OPCs are activated, migrate to where they are needed, and mature into myelin-producing cells which repair the damage. The researchers examined the impact of the latent HHV-6 on the activity of human OPCs, which was possible through the work of Chris Proschel, a co-author of the manuscript with expertise in the generation of human OPCs. One of the ways the virus stays hidden in cells is by expressing a protein called U94 that helps it keep its place in the human DNA and remain undetected from the immune system. By studying human cells and transplanting human OPCs into animal models, the team discovered that when U94 was expressed in OPCs, the cells stopped migrating to where they were needed. What is still not fully understood is the relationship between the extent of the viral infection in the brain and the severity of diseases like MS and other demyelinating diseases such as leukodystrophies and Vanishing White Matter disease. For example, do the number of infected cells need to reach a certain threshold before OPC function is impeded? 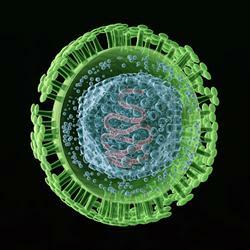 Are individuals who have congenital HHV6 more vulnerable to severe forms of these diseases?